June 2019 - Do you have a problem quilt top? Bring a quilt top for our afternoon program on "suggestions for problem quilt tops". This includes piecing, design, and "make it work" solutions. March 2019 - Sew Time! 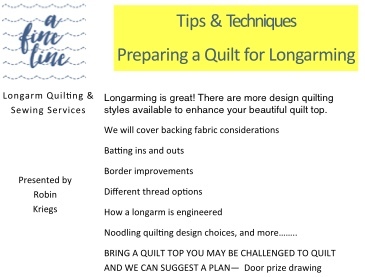 Bring your machine, supplies and project or start on the next Challenge/Charity as presented by Pat Hansen and Christine Ravish during the March meeting. November 2018 -Bring fabric donations for sale at our February "Airing of the Quilts". Fabric needs to be organized into similar coordinates then pressed, folded, and packaged in clear plastic bags. Pricing will be done by Sandy Jolliff and committee. October 2018 - Robin Kriegs- will demo Square to Hexagon and show some sample projects. If you are interested in trying this folding method bring already cut squares like a charm pack or layer cake, a cutting mat, ruler, a 6" long or longer and rotary cutter. While the hexagons will not be technically perfect, they can be used for some cool applications. Pat Hansen -Continuing with Robin's hexagon theme, I will demo the technique for making Kaleidoscope hexagons. At the last meeting we saw Susan Sadi's "One Block Wonder" quilt which is a beautiful, complex design and made with just one novelty fabric I will show you how to select the best fabric to create the blocks. This info is found in the Magic Stack-n-Whack Quilts by Bethany Reynolds and One-Block Wonders by Maxine Rosenthal. The hexagon blocks created are fascinating designs and can also be used individually in modern quilts settings. I love them all. 2nd Sew Day for Charity Quilt for center layout and piecing. Many thanks to Kathy Hayes for volunteering to sew side layouts from August meeting. 1. Sewing Machine with white or very light gray thread for piecing (NOT required - we need a couple of people to just help press/iron). Pat Hansen will present the January challenge Elements of Scale with a slideshow presentation. 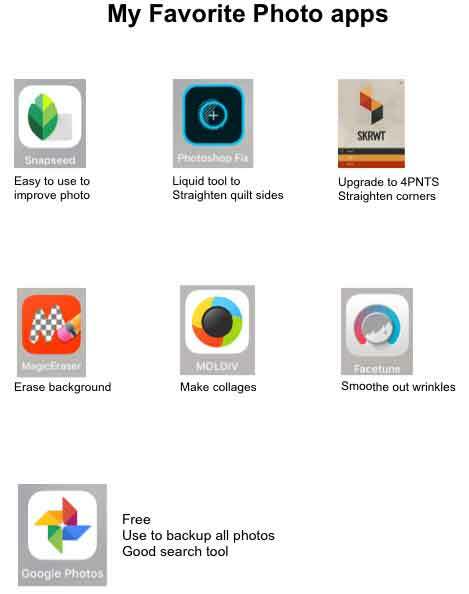 Christine Ravish will show us how to take a near-perfect quilt photo, Carol Byrnes will show photo apps for imperfect quilt photos and other favorites.